Over a year and a half ago, we found out that our last and final baby would be a boy. 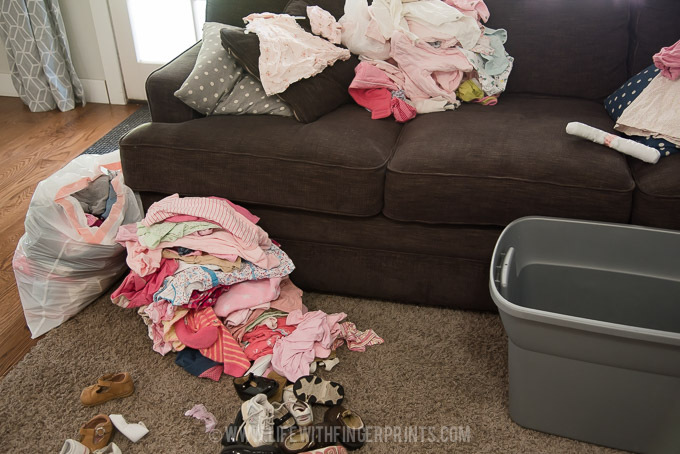 With great sadness and in an emotional pregnant state, I climbed the ladder to our attic and looked over 12 pink Rubbermaid bins of girls clothing. Clothing that I held on to in hopes of using it again one day – all of which I could now get rid of. Part of me wanted to donate it sight unseen. But the more rational side of me wanted to see it all one last time and pull out a few pieces to save. I spent hours over several days going through all the bins and in the end I had a few pieces to save, and many garbage bags full to donate. It felt oddly satisfying. Although these weren’t bins that I saw or managed on a daily basis I loved knowing that my attic was free of the extra stuff. I don’t know about you but as a young family, I have spent the better part of my marriage accumulating “stuff”. Baby/children gear, toys, holiday decor, lawn tools, power tools, kitchen gadgets, clothing and the list could go on and on. Much of the stuff was purchased to serve a purpose…we needed/wanted it. I feel as though I’m a responsible consumer. I’ve never spent more than I had, I always do my research and most of the time I find pretty good deals. All was good. 13 years later we have a good sized home full of…”stuff”. But when I emptied out the attic of pink bins, a little seed of change started to grow. It was as if a light went off in my head. I’m a fairly clean and organized person and yet it has all become too much. 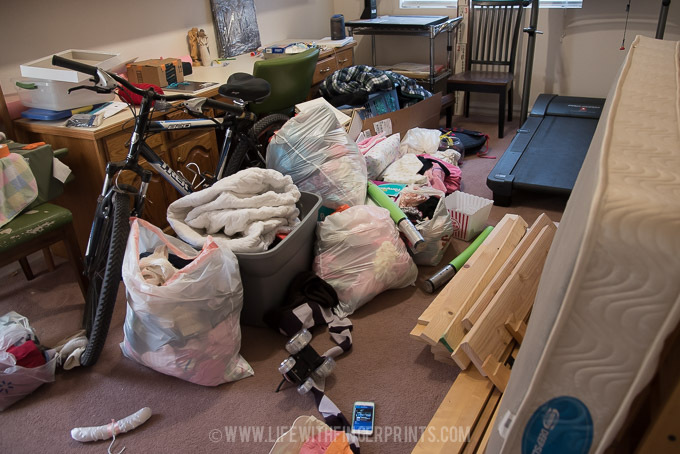 I am tired of being frustrated that my kids can’t keep the playroom clean. I am tired of shuffling clothing and yet never finding what my kids need – shoes included. I am tired of spending time organizing the same items over and over again. I am tired of dusting books I’ll never read. I’m tired of games missing pieces. I am tired of wearing 20% of my wardrobe 80% of the time. And most of all I’m tired of spending time looking for things. This led me to a couple of great purge days – but yet I kept bringing more stuff into the house voluntarily. I started following a Facebook account about becoming a minimalist. And I enjoyed reading the encouraging quotes or interesting articles. But I quickly realized I couldn’t ever see myself as a minimalist. I have too many passions and hobbies and love holiday decorations. And although being a minimalist wasn’t in my future – I craved the idea of owning less. Less clothing. Less toys. Less stuff. Briggs birth became a catalyst for change. For the first time since having kids, when he grew out of clothing – I got rid of it. I had no need to store it any longer – I wasn’t passing it on to a sibling. The same for all his baby gear. The swing. The bouncy chair. The swaddles. The bottles. You know how much stuff I had accumulated over 5 kids?? A lot of stinking stuff and I didn’t have to hang on to it any longer. It was freeing. 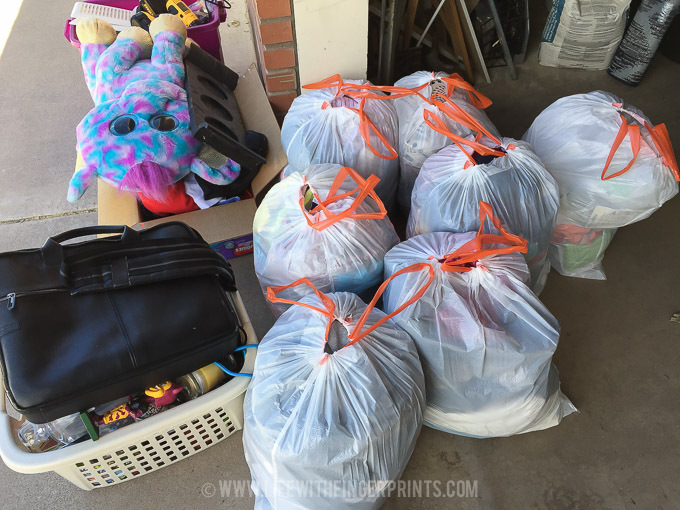 Getting rid of baby stuff felt great and the mentality started to bleed to other areas of the house. We tackled Hallie’s clothing. I made her try on every piece of clothing she owned – most of which I had purchased, some of which had been handed down to her. About half way through, she was tired of me asking the same question – Do you love it? – and was ready to be done. In her frustration she snapped, “You’re the one that bought all this clothing for me.” Ding, ding, ding. She got me. She was absolutely right. And her words cut deep. I am the problem – Steve does not purchase anything – its all me. I had to change my habits and my family would follow. 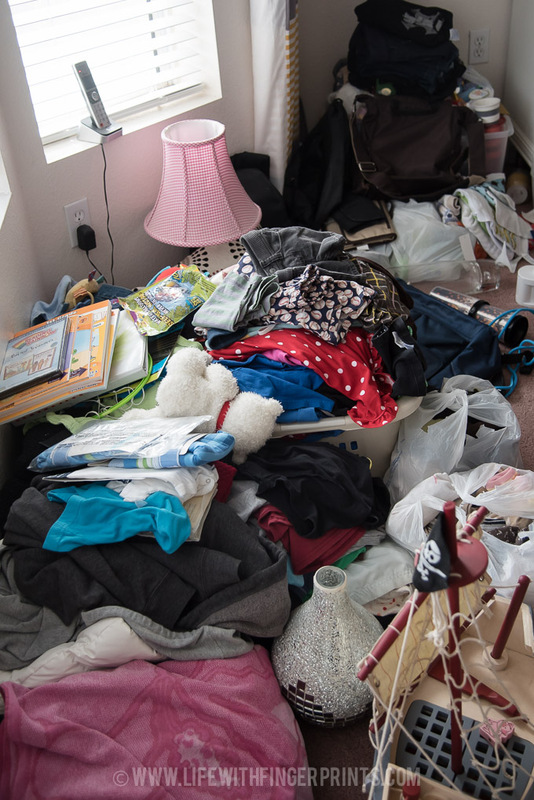 I read The Life-Changing Magic of Tidying Up which was great to kickstart the process of purging – although some of the ideas were a little crazy to me. But then I read The More of Less and it resonated deep within me. I realized I didn’t need to get rid of everything. I just needed to get rid of enough so I can live the life I’m wanting to live. The life I could live if I didn’t manage so much stuff. I can have my holiday decorations and power tools and yet own much less in many other areas. The corner of our room and a corner of the storage room became the donation location and every week the piles grew and grew (everything except the bike – not sure why it was in the storage room!). I tried to add 10 items to my pile every day. Most days I far exceeded that. I started to become embarrassed by just how much there was and how easy it was to get rid of it. I started to tackle cupboards I hadn’t touched in years, or better yet drawers that barely opened. I made frequent stops to drop off donations. I’ve still got a long ways to go – I’m sifting through years of accumulation but I’m making progress and the progress is motivating. I think what has changed the most is my mentality of purchasing items. Yes, we still need stuff and even want stuff and I have no problem making those purchases. But I’ve become more critical of what comes in the house. I was at Target last week and they had the cutest skirt for Hallie on clearance. I added it to my cart. As I stood in the checkout line looking over my cart – the skirt caught my eye. Immediately Hallie’s words came to mind, “You’re the one that bought all this clothing for me.” She didn’t need the skirt. In fact she has more dresses/skirts than she needs (but she “loves” them all). I decided to not add to the problem. The skirt wasn’t needed and I removed it from the cart. Something that wouldn’t have even crossed my mind a year ago. The idea of being critical of items coming in isn’t necessarily a financial decision – although there are plenty of financial benefits. It’s a state of mind that offers peace to me. Do I like updating home and decor items? Absolutely. It just means I need to get rid of the items that are outdated, even though I paid good money for them at some point. Why is it so hard to get rid of items you perceive to be of any value – even though you don’t necessarily like the item??! I’ve found this mentality to be one of the hardest hurdles to overcome. But I’m getting there. And being critical of what comes in has really helped. I’m on a journey. Sometimes I get down on myself that I’ve been working at this for awhile and I have a long ways to go – but that’s why its a journey. I am having to change habits and work to let go of things, it’s not happening overnight. But it’s happening. And I love the change I’m seeing. The funny part is – it’s a change that nobody outside our home may ever notice. They won’t see the semi-empty entertainment drawers or the space in the attic that was once filled with boxes. Luckily, I’m not doing it for anyone else to notice. I’m doing it so we can live a better life as a family. One day at a time. Amen! I’m on a similar journey and boy, it feels good. Just like you said it’s all about changing how you think of buying things (or things your kids get for free- I let them enjoy whatever for a day and then it’s out of here! If I even bring it into the house.) That’s been a hard mindset for me to switch, getting rid of stuff I’ve paid for, but also not taking something just because it’s free. Sometimes it’s hard controlling what comes in when you have family adding to the present pile. Even if you are surprised and add another child you would probably bring less stuff into the house.